The application for the European Cryogenics Course (ECC) 2019 is now open. The Course is organized by the Faculty of Mechanical Engineering of the Technical University of Dresden (TUD) / Germany, the Faculty of Mechanical and Power Engineering of the Wroclaw University of Science and Technology (WUST) / Poland and the Norwegian University of Science and Technology (NTNU) of Trondheim / Norway. The ECC will extend over 3 weeks during Summer 2019 and is open to all graduate and doctoral students. Due to the limited capacity interested students should apply for participating before the end of April. From the 19th to the 23rd of August the TU Dresden will host the first part of the Course focused on "Basics, liquid hydrogen technology". The second part of the Course will take place from the 26th to the 30th of August at the Wroclaw University in Poland and will deal with "Helium cryogenics and cryostat technology". Finally, between the 2nd and the 6th of September the NTNU of Trondheim, Norway will offer a Course on "Liquified natural gas and coolers". external experts. In addition to the lessons, the program of the ECC includes technical excursions, tutorials and demonstrations. The course will finish with two written examinations concerning the two main subjects (cryogenics, fundamentals and processes). Course may be found on the flyer or at the dedicated webpage. The yearly General Meeting took place on September 3rd in Oxford, before the opening reception of the 27ICEC-ICMC2018 conference. At the GM the secretary reported on the activities of 2018 and the treasurer communicated that the finances of the association are in good health. Agnieszka Piotrowska and John Weisend presented respectively the candidacy of the Wrocław University of Science and Technology and of the European Spallation Source to host the European Cryogenic Days in 2019. The decision on the location will soon be made by the CSE board. Ronald Dekker resigned his position as Board member and the assembly elected Tonny Benschop, who will be the new CSE treasurer. We wish to thank Ronald for his work during the past four years and for his commitment as new member of the CSE advisory council. We warmly welcome Tonny in the CSE Board! DH Industries are proud to announce that the BOG management system for the "Clean Jacksonville" bunkerbarge has been tested successfully. Read more. WEKA AG is proud to announce that it has been awarded the "Silver" rating for corporate social responsabilities by the independent audit company Eco Vadis. Read more. Demaco is proud to announce Wilstier Industry as Demaco’s Authorized Dealer. Wilstier Industry is serving customers with engineering, installation, and maintenance across the whole country of China. Read more. 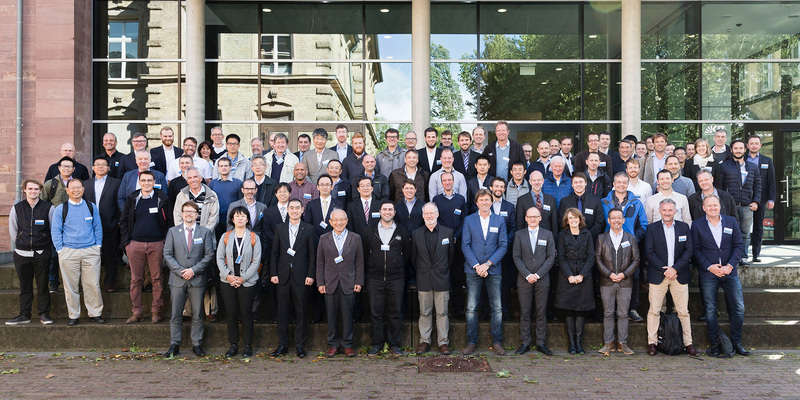 The third General Meeting took place on September the 13th in Karlsruhe, Germany, within the European Cryogenics Day, organized in conjunction with the 2nd International Workshop on Cooling of High-Temperature Supeconductor Applications (EDC-IWCHTS 2017). At the GM the Board reported about the activities and the financies of 2017. More details can be read in the minutes of the meeting. You can find pictures of the event here and a copy of the presentations of both the ECD and the workshop here. The International Cryogenic Engineering Committee awards a young researcher for outstanding work in cryogenic engineering. The award is named after Gustav and Ingrid Klipping to commemorate their enormous contributions to the field of cryogenics and more specifically to recognize their active role in involving young researchers. The award will be given on the occasion of the International Cryogenic Engineering Conference, which is held every two years. The next Conference will be in Oxford, UK, September 3-7, 2018. The candidate shall be 35 years old or younger on the starting date of the conference. The awardee will receive a certificate and a check of 1000 CHF, plus a waiver of the registration fee of the ICEC conference at which the prize is to be awarded. The prize will only be awarded if the winner attends the conference and at the conference presents a paper on his or her recent research. The candidate must be nominated by a person who is active in the field of cryogenic engineering. The nomination should be supported by the person who has supervised the research work for which recognition is sought. Note that the latter person may be different from the nominator and, furthermore, that the host institution where the cited work was conducted can be different from the awardee’s past or present employers. Nominations shall be sent via email to the chairman of the ICEC, h.j.m.terbrake@utwente.nl by October, 16th, 2017 at the latest. copies of the publications on the research work to be honored. The nominations will be voted on by the board members of the International Cryogenic Engineering Committee. The winner will be notified by December, 21st, 2017 at the latest so that he or she can arrange to attend the 2018 conference. Peter Gifford, 68, of Syracuse, New York, passed away at home surrounded by family and friends on January 29, 2017, after a courageous battle with esophageal cancer. He was the president of Cryomech, which is a world-leading manufacturer of Gifford-McMahon and pulse tube cryocoolers. The company was founded in Syracuse in 1963 by his late father, William Gifford, the inventor of the Gifford-McMahon cryocooler and the first version of a pulse tube cryocooler. Peter, who was born in Washington, DC, and moved to many places with his parents, finally settled with his parents in Syracuse in 1961 when Peter was 12 years old. He was a tennis champion in high school and played on the city championship high school football team. He studied physics and math at Syracuse University before graduating with a Liberal Arts degree. In 1973 he began working with his father at Cryomech, which at that time had only two full-time employees. Peter took over full leadership of the company and its handful of employees in 1980 after his father became ill with cancer and later passed away. Peter and his employees, whom he treated as part of his family, were able to grow the company into one of the world’s best known cryocooler companies, which now employees about 130 people. The company designs and manufactures cryogenic refrigerators for use in cutting edge research and production from agriculture to aerospace. Peter’ success in growing the company partly stems from his keen insight into the need for a niche market catering to the needs of researchers in a wide variety of cryogenic cooling applications. Whereas his competitors focused mostly on large mass production markets, Peter found an important need for the development of cryocoolers for many new applications. 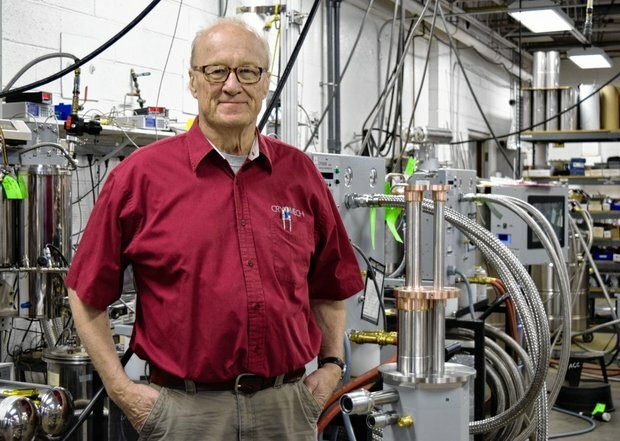 Cryomech has been especially successful after the development of the first commercial 4 K pulse tube cryocooler, which has become an important tool for researchers who previously used liquid helium in experiments, but are now switching to cryocoolers as the helium price has greatly increased and its availability has become erratic. Peter made Cryomech successful by doing things no other company could do. His physics background helped him understand the scientific challenges his customers faced. He enjoyed challenges and developing new things. The company also became successful because of his contagious, outgoing personality. He always had a smile and a knack for making you feel appreciated. His laughing, joking and storytelling would put you at ease immediately. One of the highlights of my trips to conferences was a chance to talk to Peter, usually at the Cryomech booth in the exhibit hall. His enthusiasm made me feel good and I could enjoy a few laughs with him. He was very kind to his employees and treated them as part of his family, often hosting informal get-togethers for the whole company. After being diagnosed with cancer, he began to plan for the long-term future of the company. Instead of selling out to some larger company or venture capital firm, whom he feared might strip the company and move it away from Syracuse, he decided to offer it to his employees through an employee stock ownership plan (ESOP). He wanted it to remain in Syracuse because of his employees and because of the supportive nature of the business community in upstate New York. The company went ESOP in 2014. In an interview with the Syracuse newspaper in 2015, he explained that his approach to dealing with employees and customers followed the Golden Rule: Do unto others as you would have them do unto you. When not at Cryomech or interacting with attendees at conference exhibits, he most often could be found alongside some stream somewhere in the world enjoying his favorite pastime of fly fishing. He built a house in the Catskills on the bank of the West Branch of the Delaware River in Hancock, NY, where he could fish, relax, and enjoy the environment in the presence of his family and many friends. He is survived by his wife and partner of 37 years, Lorraine Koury; sisters Jenni Shone (Robert) of Strafford, NH; Hilary Gifford (Ben Guthrie) of Trumansburg, NY; and brother Robert Mac Gifford of Syracuse, NY. Peter, rest in peace and catch lots of fish. In the early 80s, as a PhD student, I learned about “Gifford” as the guy who had invented the GM-cooler together with MacMahon. I used these GM coolers in my PhD research and I recall that later in my career I had the opportunity to meet Gifford’s son Peter at one of my first EUCAS conferences at a booth of Cryomech. What an impressive personality and what a pleasure to sit and talk with him, totally different from what at that time I had in mind as typical company leaders. Following that first meeting, I took the opportunity at all cryogenic conferences to go and look for Peter, for a quick chat or a longer discussion on what we would need for our specific applications. I do recall the visit to Cryomech at the 2014 International Cryocooler Conference and the last words I then had with Peter. I did not know at that time that he was already seriously ill. The cryo-world lost a great personality, a great innovator and stimulator. We express our deepest sympathy to family and friends and to the Cryomech team for the loss of Peter.